Announcement Reiki Charged Bracelets, Gemstone Bracelets, Chakra Bracelet Sets & Yoga Bracelets! •This link will take you to my official Serenity VIP Club where you'll automatically be spoiled with secret coupons, giveaways, sneak peeks, free repairs and more! 2019 Collections are in the making! Be sure to join the exclusive Serenity Circle Insiders Facebook Community to claim first dibs on all new upcoming designs! Filled with trendy styles of high vibrational energy bracelets, this collection is sure to be the perfect gift for a friend, daughter, mother or loved one. Give the gift energy, give the gift of love! Filled with wonderful gifting items this collection features high vibrational Reiki imbued crystals carefully put together to help you live your intentions! Give the gift of Energy healing, give the gift of love this Holiday Season! Leaves, fall, pumpkin spice and everything nice! The stones chosen feature leaves as well as change and easy transitioning properties so that you can embrace change and live the life you are destined to live. Now showcasing one of the biggest collections released by Yeli. The awaken your senses collection will take your senses on a trip to a magical world of peace, calmness, at the same time they stimulate all your senses, even the 6th sense, your intuition. Combining the diffuser lava rock beads, with the energy of Reiki, and the properties of the crystals, these bracelets can do so much more than what you ever dreamed a mala could do for you. Featured in over 250 different worldwide news sites including ABC, CBS, NBC, FOX, Yahoo Finance and Digital Journal, the energy bracelets of this collection have created a huge hype amongst yogis, energy practitioners, and meditation circles. The bracelets in this collection are designed to enhance meditation by benefiting from the energy from natural stones and the energy of Reiki that help you be more focused on truly living your intentions. Bracelets are made from semi-precious gemstones so you can benefit from all their wonderful properties and bring these into your meditation and your daily life. Learn more about my Reiki imbued jewelry, view photos of my process, see customer photos, and more on my website: www.SerenityByYeli.site - Coming Soon! Serenity by Yeli ships worldwide, please contact me so I can set up your international shipping profile. For the shipping times on each item, be sure to check the shipping panel on each listing, as some bracelets & malas are created specially customized for you and take a bit longer to ship than others. Every item shipped is guaranteed to get to you safely and in the event that something happens in the mailing process, I will take care of you! Rest assured that your experience with my shop will be a positive one! I will always take care of you. Feel free to message me if you have any additional questions! I'm always here to help! Lots of Love and Serenity. 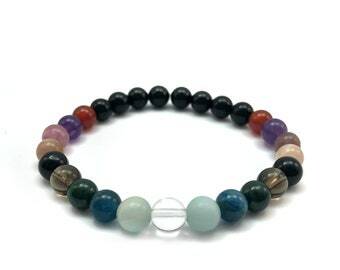 Reiki Charged Bracelets, Gemstone Bracelets, Chakra Bracelet Sets & Yoga Bracelets! Our customers’ favorite Empath protection bracelet available now in chip! 12 Chakras Bracelet including stones for earth star chakra, zeal point, and the most relevant ethereal chakras! This trendy protection bracelet has it all! Quality and service is what I strive for! Carefully chosen stones and materials make your mala a stunning jewelry piece that does so much more! As a full time Etsy seller, I am committed to help you live your intentions through my craft! Your intentions mold your reality. Meditation, breathing, letting go, are all important tools to calm our fussy minds and find ourselves in the midst of our busy lives. In finding yourself, you uncover the deepest feelings rooted within your subconscious and start your true journey to living your intentions. My name is Yelisa Rojas, I am a mother, wife, Reiki Master and creator of Serenity by Yeli. Rooted in the US after having lived in other parts of the New World as well as Europe. Life can feel pretty chaotic at times, we are always busy running around against time with little to no seconds for ourselves. Meditating and spending time nurturing our soul seems like such a guilty pleasure when there’s always so much to do. Stress and anxiety escalate and we lose connection with our deepest feelings rather than working towards having a peaceful mind, body, heart, and soul. In today’s hectic lifestyle, we need a constant presence to remind us that there is a place where mind body and soul can live in harmony, to help us live our intentions. Our products are so much more than beautiful jewelry. They are the tools that will provide that constant reminder while enhancing the natural energy of the stones with Reiki. The channel for finding our true self and creating the habit of being in touch with our spirit. The way to always carry with us the magical properties of natural stones to help achieve the balance of mind, body, and soul. Wear your bracelet to start your new life routine. Find yourself, nurture your soul. Benefit from all the wonderful natural properties of the crystals and receive the shower of Reiki energy that will set your mind in tune with your spirit. Take time to nurture yourself, and “Live your intentions”. Join the dozens of wonderful souls that have chosen to change their lives by wearing our handcrafted energy bracelets while we help them set their intentions and shape their lives. My mission is to leave a positive footprint in your life and change it one stone at a time, one intention at a time. My name is Yeli! I am a full-time Etsian, working daily to help you Live your intentions one unique energy bracelet at a time! My name is Elisa and I bag and choose the gemstone goody that is added to your order. To fulfill your order, you must provide me with certain information (which you authorized Etsy to provide to me), such as your name, email address, postal address, payment information (I do not personally see your payment information, credit card details, etc- as these are processed securely through Etsy), and the details of the product that you’re ordering. You may also choose to provide me with additional personal information (for a custom order of jewelry, for example) if you contact me directly via Etsy messages or through a private note attached to your order. -Shipping Service providers. I engage certain trusted third parties to perform functions and provide services to my shop, such as delivery companies (specifically USPS). I will share your personal information with these third parties, but only to the extent necessary to perform these services and ship your order. -Object. You can object to my processing of some of your information based on my legitimate interests and receiving marketing messages from me after providing your express consent to receive them. In such cases, I will delete your personal information unless I have compelling and legitimate grounds to continue using that information or if it is needed for legal reasons. To opt out of emails that you have previously given me personal consent to join, you may also click the "unsubscribe" button at the bottom of any emails sent to you from Serenity by Yeli. This does not include messages direct from Etsy, as I do not send these emails personally and you would need to unsubscribe from Etsy's specific emails and services in order to retract your consent.